Get up close and personal with Melee Tactics Toolbox! The new tips, tricks, and tactics in this volume enable your Pathfinder Roleplaying Game character to perform a huge variety of daring deeds in hand-to-hand combat, whether you’re dashing around a foe to flank it by yourself or inspiring allies to hold the line on a castle wall. Basics: This book is all about the aspects of melee combat and on that premise it delivers. Mechanics: There are some fantastic options mixed in with a lot of poor options that will not fare well. Feats are important choices and most of these feel like they are better suited for an NPC. Theme: This is where it shines giving you ways to bring melee combat alive if you don't mind toning down the power level or taking niche options. The new weapons inside are my favorite part especially the Orc Skull Ram. Execution: It was unbalanced but shined in some examples with weapons and combat styles. Summary: If you know there is content in this book you want your character to use pick it up. Choices can be sub-optimal or niche so diving in to explore may result in a less than stellar experience with this thematic piece. 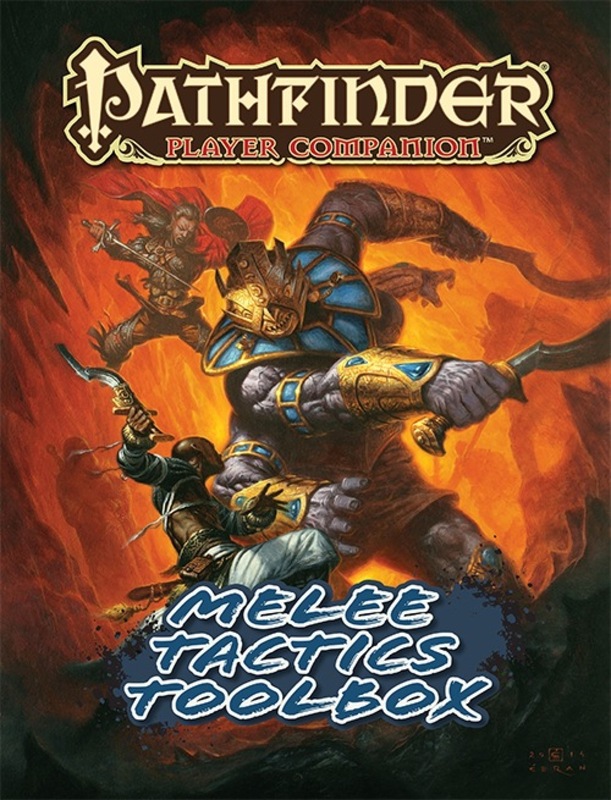 Like Ranged Tactics Toolbox, Melee Tactics Toolbox is primarily a book of character options, this time focusing on mêlée combat. Like its companion, it doesn't actually spend a great deal of time on the tactics of its title, but does have scores of new feats, weapons, magic items, and more. Also like its companion, it seems to be desperately trying to create new things for something that doesn't really need any new things added to it. By itself or in conjunction with Ranged Tactics Toolbox, Melee Tactics Toolbox will likely be a useful resource for players, but in conjunction with the scores of other books out there, it will likely be mostly forgettable. It's not a bad book; it just doesn't really stand out. Basics-Why do it from afar when you can hurt them up close! 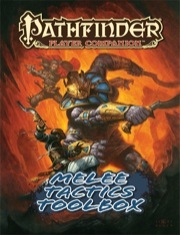 Melee Tactics Toolbox provides every up close and personal character with several new options ranging from spells, items, feats, class options, and even new archetypes much live every other player companion product. Amazing, useful, thematic and clever feats and abilities for those who like it mix it up hand to tentacle with golarions nasties. Visit A Gaymer's Quest to read the whole review. Let's start with the obvious: there's a calikang on the cover of this module. I've loved this monster since I first saw it in the Inner Sea World Guide, so I'm always happy to see it getting some press. Sajan and Jirelle look like they will get the best of it. It's interesting that Sajan is holding a weapon. One of the book's later sections goes to great pains to remind us that unarmed combat is melee combat as well, so I would have liked to have seen him fighting unarmed. Calikangs don't have any damage resistance, so a good flurry of blows (unchained or core) would be a great attack on one of these beasts. But that's imputing game design on art. Art's job is too look cool. And while I think it might have been fun to have Sajan flurrying away on the calikang, he and Jirelle (who I hope has some sneak attack damage coming, swashbuckler or no) look like the bad asses they are taking on this hulk. In fact, much of the book's art is really good. It's not an action scene, but page sixteen illustrates all the various swords that exist in the game. It's very cool and helpful--the best quality in a gaming aide. Page 27 also has a good picture of Lini holding what appears to be a spell siphoning sickle and ready to make trouble for anybody messing with her. Yay! I love seeing new posts by you! They make me giddy with anticipation. Please paizo give melee combat more cinematic options! I will await to see what it includes. I'm interested tho. Cool, although it would annoy me a bit if more than 4 pages comprise of spells. I feel this a good opportunity for spell-less classes to good unique options. Cool, although it would annoy me a bit if more than 4 pages comprise of spells. I feel the same. I hope the options are for everyone, and spells are restricted just to certain classes. I wonder if they'll have some sort of modification to the cleave line of feats that allow for multiple whirlwind attacks, etc. If none of those new spells are for the Bloodrager, I will be very put-out. But I'll still buy this. I will passing on this one and the ranged tool box one as well. Mildly interested in this one. Don't think it is my cup of tea, but I am certain it will be a great product. I really hope this will allow some option to reduce or negate the soft cover penalty for reach weapons. Any spells in this should really be focussed on the Bloodrager, Magus and Alchemist. Although I'll definitely be getting this one.. I am curious what they are going to put in this. The way I see it the three branches of Melee combat are THF, TWF, and Grapple. Maybe we will get a Jouster Swashbuckler archetype? Here's hoping for more touch spells for the magus? Perhaps, but I am never sure how much the narrowness of the Magus Spell lists in term of touch spells is intentional. After all close combat and spellblending are included as arcana for a reason. Don't forget Sword and Board (similar to TWF but different enough to be its own beast) and reach weapon. I would have loved to see a Magus that can wield weapons in 2 hands and still do spell combat etc. That would be a great archetype. Honestly I remember them, but I see Sword and Board as well as Reach as more subschools of TWF and THF, respectively. Arguably grapple might better be conceived as a subschool of combat maneuvers however. I honestly do not think they will ever do a THF with still doing spell combat without a severe penalty. I have not played it, but I honestly think you can probably be fairly solid with a magus using a THF style build. You just need to focus on casting spells with more charges than shocking grasp. Also it should be pointed out that still arcana and still metamagic let you mix in a style going for a big single hit. Which given this is a 3/4 Bab class is a somewhat viable option until level eight or so. That said I would like some more stuff for the Magus, but honestly they have a really good tool kit already. Maybe, maybe an arcana or archetype that lets you open up some of the brawler options would be interesting, especially if it retained spell recall. Also maybe a little clarification on the swashbuckling arcana. I agree that THF magus is doable. However, people generally just want more options to encourage builds other than the boring scimitar business. I've seen GMs ban the magus class, not because they think it's overpowered, but because they're so sick of every magus having the same build. A defensive-counterattack non-twf sword and board is missing in the game. Well arguably the defensive counterattack is sort of the point of the Swashbuckler. I am curious at the statement about all Magus having the same build, I know of several variations on theme you can do. Immediately the temptation is very much to go for finesse and crit range. However even a strength Magus is going to want to pump up their critical range. Benefit: Double your weapon's base damage dice on a charge. Benefit: Triple your weapon's base damage dice on a charge. Benefit: When wielding two weapons, you may attack with both weapons when making a standard attack or charge attack. More two-handed, sword&board, and charging type feats I hope to see. "Featuring tons of never-before-seen rules options..."
So FINALLY we'll get non-swashbuckler finesse love??? That would be really nice. Anyway, I'll gladly jump in to see what new cool stuff is inside this Companion. Love for a falchion wielding Orc swashbuckler would be nice please. Honestly, I'm hoping for Weapon Fighting Style Feat Chains, and specifically NOT MONK Weapon Fighting Feat Chains. I'd love to see some sort of advanced rogue or slayer talent open up the base level mutagen ability to those classes. Maybe sacrifice several talents to gain mutagen increases as an archetype or something. I'd like to see some new options for martials to do things in combat, really just new actions, ones that are viable even in the face of BAB 11+ full-attacks. Yes please I am ready! Oh dammit I saw falchion, melee styles, and feats and I just dropped a brick. Why must it be so far away though. I really want to see some sort of fighting style for a two handed melee weapon user, some sort of duelist who can fight effectively with a falchion, greataxe, or greatsword. Not just this one handed or unarmed garbage anymore. Yesssssss. Looking forward to this. The Ranged Tactics Toolbox was kinda neat (minus the brokenness of the Silver Nocking Point and the Tuned Bowstring), but I've been hoping for more melee love. First the Giant Hunter's Guide brought us the oversized-weapon-wielding Titan Fighter Archetype, and now this! It's a good day for face-smashers! Cool, can't wait for those new feats and magic items. It is nice that we are getting some tactics as well. I like the cover art. I love that Sajan got on both the melee and ranged tactics toolbox covers. If this is even half as useful as the ranged tactics toolbox turned out, then February is going to be a LONG month. Since they started the new skill uses (like in Giant Hunter's Handbook) FINALLY, maybe we will see new skill uses in this book. Like climbing atop larger foes and attacking! I hope a ruling is in here for that. The guide to the 20 different kinds of swords sounds like it's going to make the book worth buying all by itself. I'm hoping we get some stats for blades like the estoc. I did, in fact, include the estoc. Was your involvement in this book similar to the Dirty Fighting book coming soon? Good news, and thanks. I do seem to recall you also mentioning it in one of the old Super Genius PDFs, I'm eager to see the 'canon' version of that blade.